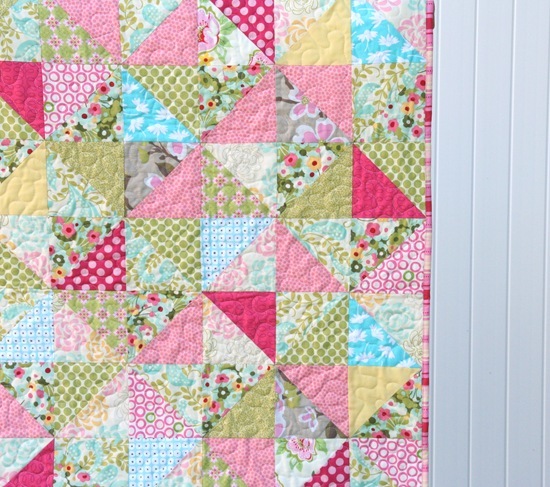 This girly little number takes after the January quilt….except its packed with pink. Its full of fabrics from different lines, just the way I like it. As with most my quilts I have a hard time thinking up a name, so its the June quilt. This one went together quickly (thanks to long naptimes) and used up the last bits of some of these fabrics that were hiding in my stash. The back is an Amy Butler print and the binding is from Sandi Henderson’s Farmers Market line. It measures 30.5″ x 40.5″. Hi there! 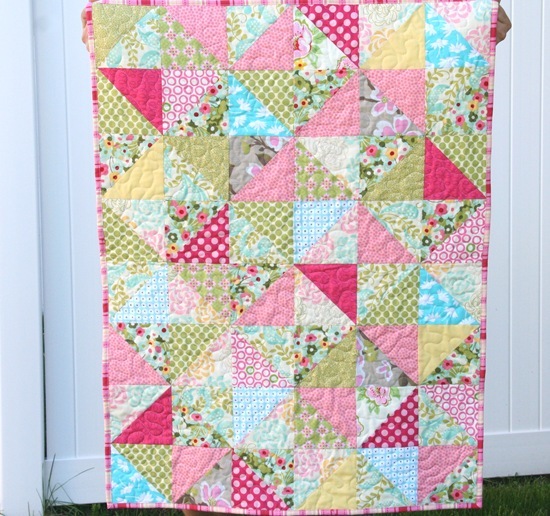 I LOVE this quilt – so pretty. So sweet!! Perfect for a little girl!! Love it! I love your color sense. It's a lovely quilt. Gorgeous!!! I love the colors! It's so pretty! Love it! Is there a way you could let us (or me?) know what fabrics you used? I have been looking for this exact color combo for a quilt for my daughter but after endless online and in-store searches, I am not having a lot of luck. I am fairly new to quilting so I don't know all of the places to look/designers/etc…I also have a hard time looking online because I never know if the colors I am choosing are true to their real colors and if they will go with what I already have. So gorgeous! I love the colors and the design. Hi I am new to your blog, it's so inspiring. I love your quilts! You are so talented. I have bought a pack of quilt squares to try and make my first quilt. Right now I am treading water. Not sure where to start. I think this is one of the prettiest quilts ever. I'm off to get one started for my craft room wall. Thanks…love following you! Oh, I love this! Excellent color/print combinations. So beautiful. LOVE the colors. What a beautiful quilt. Perfect for a little girl. What a beautiful quilt. You did an excellent job matching all those fabrics and the points. I only hope to be as good as that. beautiful quilt and beautiful colors. Love all those beautiful colors and the way you mix the designers, fun!! Sweet dreams to one lucky little girl! Just beautiful! 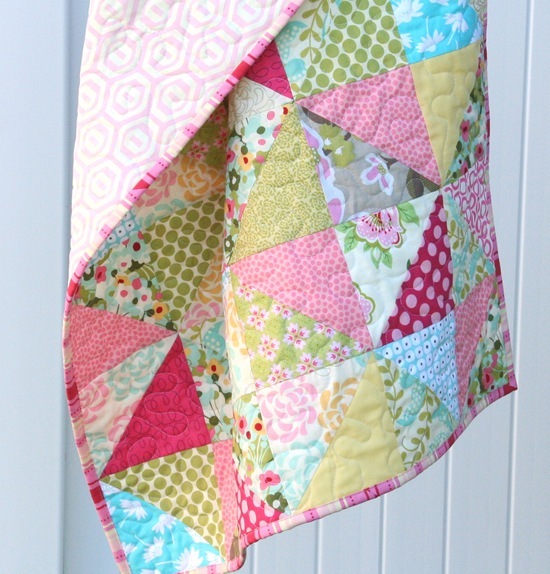 I love that quilt the colour combination is really fab. Just darling! I wish I had a girl..
Love the materials and the pink . It is a beautiful baby quilt. Perfection! Great fabric choices! Do I spot some Hunky Dory in there? LOVE that line of fabric! That's a beautiful quilt! I'm sure lots of cute little girls are born in June so the name fits, too.